History of Wild Rose as the "Village of Roses"
"Roses for the Village of Roses (Wild Rose, WI)"
The scenic village of Wild Rose, Wisconsin, has evolved from a grist and grain milling town to a picturesque, mid-Wisconsin center for tourism. A dozen or more nearby lakes, the famous Pine River trout stream, the Wisconsin State Fish Hatchery, the Village’s own millpond on the Pine River and hundreds of acres of surrounding native oaks and pine trees have encouraged a myriad of outdoor summer and winter activities. Hundreds of campers, cottage dwellers and summer visitors swell the population from Memorial Day to Labor Day and more come for the fall hunting seasons and winter sports. These visitors make significant economic contributions to our local economy. The existing area attractions are impressive enough to encourage a few people to choose the Wild Rose area as a permanent home. With improvements in Wisconsin Highway 22 many years ago parallel parking was implemented along Main Street and some of the charm of the original village lost. There is a need to revitalize Main Street, the entire State Highway 22 drive through the village, and the two major town entrances. One of the obvious missing elements is the lack of landscaping and color from ornamental plants. These landscape improvements could be another reason to attract baby boomers and others to choose the village for their home. There is ample social science research findings that show that landscape plantings, and plants in general, affect communities in ways that go far beyond simple beautification. Roses are not a new idea for the village. In 1958 the Wild Rose Women Club with the leadership of Ms. Lois Walters, Ms. Margaret Brownlow and Mrs. George Dopp, won the national community improvement award sponsored by The General Federation of Women’s Clubs and The Sears Roebuck Foundation They received a $5000.00 award. Seventeen hundred dollars of that award was designated for a rose garden in the village. In the 1973 book, "Village of Roses," Jerry Apps wrote, "Rose planting continues to be a major beautification project for the village. With the help of Mrs. Grace Kulow, an active member of the American Rose society, the village set out to establish a rose garden planted in historical sequence. With help from various nurseries, roses of historical significance were planted." Unfortunately, this rose garden did not survive to the present time for two obvious reasons: 1) the difficulty in growing many of these roses in USDA Hardiness Zone 4, and 2) lack of advocacy after many years of disappointing results with tender roses. Recent advances in rose breeding (Knock Out Roses, Easy Elegant Roses. Canadian Explorer and Canadian Parkland Roses) make it possible to grow winter hardy, continuous blooming, disease free shrub roses in cold Wisconsin communities. Combining these new roses with other landscape plants could significantly improve our village’s appearance and imprint in our visitors a memory of that special place called "Wild Rose- The Village of Roses"! With newer more hardy landscape roses it seems appropriate that another effort be made to re-introduce roses and landscape improvements into the village. There are many potential sites within the downtown area of the village for planting roses and landscape plants. Many of the sites are privately owned and the owner’s cooperation would have to be sought. In some cases existing soil could be used and in others soil amendments (sphagnum peat moss, lime and fertilizers) added. Irrigation may also be needed during extended periods of drought. 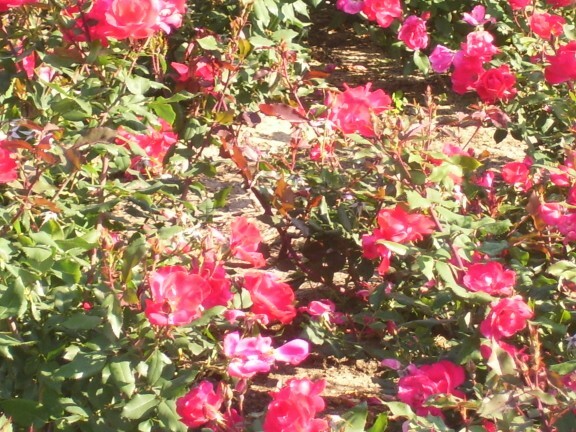 Research has shown that some of the Knock Out roses are quite drought tolerant. There are also potential sites along highway 22 as you enter the village. A couple of prime sites are on the grounds of the US Post Office and the St. Paul’s Lutheran Church. One of these sites could be used to demonstrate the feasibility of once again growing roses in the village. It is also possible to grow some of the hardier shrub roses in large containers. Simple square and rectilinear containers could be constructed from treated wood to showcase these roses. They could be placed in strategic places in the downtown area. Generally these containers would need to have a box depth of 20 or more inches. To have an impact the square boxes need to be about 5x5 feet wide and planted with 5 roses each. They would also need to be constructed such that they could be picked up with a lift truck in late fall and stored in a non-heated poly house (3 ml, 55% shade polyethylene). This storage method prevents wind desiccation. Rectilinear boxes could be made for more confined spaces along the main street sidewalks. These narrow containers might be 2 feet wide, 6 feet long and 20" deep and planted with 4 roses. In order to have a consistent design only 2 or 3 different shaped configurations are best used. Possibly a single rose motif could be routed (embossed or engraved) into the sides of the boxes and painted pink and green.